Emmylou is easily the most beautiful “celebrity” I have ever seen up close. (Sorry, Fabio.) The most star-struck I have been in my life was when I passed her on the street in NYC in ’97, a few years after Wrecking Ball’s release. I was going out the front door of the Soho Grand Hotel, and she was coming in w/ a soft guitar case slung over her shoulder. She was dressed in black like Johnny Cash, which made her white hair look amazing. As an indie rocker, I was impressed by the way she was just trucking down the street by herself with her guitar. No publicists, no male backing musicians, nada. OK, it wasn’t quite the same as the time a friend saw Jon Spencer carrying his guitar on the subway in New York without a case. But there was something punk about the way she looked vaguely annoyed and independent. I later saw her look that way on TV when she sang the national anthem before an MLB all-star game. The microphone stand fell down in the middle of the song and she held it up in this way that made it seem like, “I didn’t really wanna do this anyway, but my agent booked it, so I’ll get through it as best I can.” I liked that she didn’t mug for the camera or pretend to be into it. Maybe that’s why I can’t find a clip of that appearance on You Tube. But I started off to write about Wrecking Ball…Here’s a song from that album, which sounds like Sherly Crow might if she were 3,675x more talented than she is. Wrecking Ball came out in 1995. Daniel Lanois worked on this record with her. It is a much better record than the one he won a Grammy for with Bob Dylan in my humble opinon, although Not Dark Yet is better as a single track. I’ve recently been working with a plug-in version of a digital reverb called the EMT 250 which bills itself as being a favorite of Daniel Lanois. For those music studio geeks out there, I’m always skeptical when people say, “buy this gear and you’ll hear that sound.” But I really did recognize the sound of that unit on this album, and it’s pretty huge. 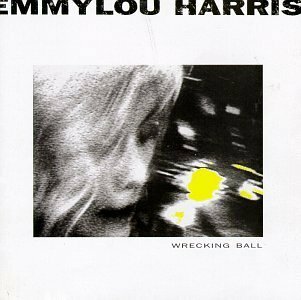 Not only is Wrecking Ball better than Time Out of Mind, but, I’m sorry, it also surpasses anything Emmylou’s late mentor Graham Parsons ever did. But of course, like Bob, he’s a guy, so he’s the legend. I mean, when I was in high school, all my indie rock boy record collector fans talked about the Flying Burrito Brothers and Graham’s solo albums. None of them talked about or bought Emmylou. Luckily, my sister and other women I know turned me on to her stuff in college. Why is it that guys don’t listen to her more? In a 2011 NPR interview, (http://www.npr.org/2011/04/29/135841061/emmylou-harris-the-more-things-change), Emmylou dismissed the view that Parsons has been the driving force behind her work ever since his death in 1973, an assumption that would subsume her own life and work under his patriarchal umbrella. The record she had released at that time contained a song about Parsons, so it’s not like she was denying what he meant to her. But she did say that she only knew Graham for a year before he died, at that they didn’t spend that whole year working together. She also says that while people focus on how emotionally devastating his death must have been, they overlook that it was also a working relationship whose loss she felt in a professional sense, too. “That was my work,” she said. “I felt I’d found where I was supposed to be in my life and what I was supposed to do, and all of a sudden, it was as if that was just over.” As she stood up for her right to have self-interest in their working relationship, her assertion undercut the assumption that as a female musician, her role was to be Graham’s caretaker, or consort. Maybe one reason Wrecking Ball sounds so much deeper to me than the great records Parsons made is that the perspective of time has allowed Emmylou to sing these songs in a hypnotically circular way that resonates with all the zigs and zags I’ve been through in my own life. I think it’s also it connects with a process I’m going through of finding my own path without my own former singing partner as I’m getting back into making records after all these years. and it’s not all down to Lanois’s production either. 07 Mar	This entry was published on March 7, 2012 at 4:44 am. It’s filed under Music, Record Reviews, Series of posts, Top 40 Over 40 and tagged Bob Dylan, Daniel Lanois, Dolly Parton, Emmylou Harris, Graham Parsons, Naomi Klein, Wrecking Ball. Bookmark the permalink. Follow any comments here with the RSS feed for this post.